I was very impressed the bar had eleven handpumps. Down to nine because two were not on. And then only six different ales, some only in fair condition. Otter Ale and Bitter, Butcombe Gold and Original, Jail Ale and sodding Doombar. Standard choice food and price. Fell slightly below my expectations based on previous reviews. Tucked away so that most tourists won't find it. A great selection of ales when I went in there, and the staff were friendly and informative too. 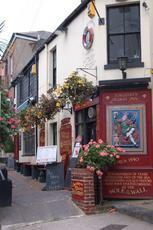 Probably the best ale pub nearest the Princess Theatre for a pre-show tipple. Popped in on Saturday evening while in Torquay for a meal. It was fairly empty at 7.15pm but there were a couple of groups eating and by 7.45pm when we left it was filling up nicely. 11 pumps on the bar that were serving 1 cider (on 2 pumps), Spitfire, Butcombe Bitter, Doom Bar, Otter Ale and Otter Bitter. 9 pumps on all together. The Jail Ale was off....which was a shame as that was the 1 beer on the pumps that I hadn't had before. Usual fare of lagers, Strongbow and Guinness completed the tap range. Lots of nautical items, including a large a Buccaneer figure standing by one of the doors. Uneven floor, wooden booths and wooden beams, making the bar feel quite low. Soft background music played while the 2 bar staff attended the bar area and the waitresses served the food. Very decent pub with a great history, apparently it's head and shoulders above the Devon Arms opposite. A reasonable place kind of what you would expect of a Torquay pub (olde world, faux smugglers, narrow backstreet etc) had a decent pint of ale and added bonus of them not allowing people to bring the brats in. Quite right too - there are loads of former pubs that are now McDonalds or 'eateries' take your brats there and don't inflict them on the rest of us.